Terry Gilliam’s The Zero Theorem was written by Pat Rushin, a man who clearly OD’ed on Gilliam’s entire career and then regurgitated it all onto a script of his own making. The fact that Gilliam himself ended up directing the film is a weird, meta-move that results in his most challenging film yet. But isn’t that always the case with Mr. Gilliam? On the surface, The Zero Theorem plays like Brazil Junior, with way too many references to mention–not the least of which is the basic dystopian feel of a not-too-futuristic world sucking humanity’s soul (updated from a Reagan-era Big Brother to today’s iObsessed techno-world). Gilliam makes the most out of his small budget to create a Times Squar-ish, sensory-overloaded city, one in which he plops Qohen Leth (masterfully played by Carnage‘s Christoph Waltz). Qohen is this film’s Sam Lowry—a misanthropic misfit on the verge of a mental breakdown who speaks like Gollum and is obsessed with finding meaning to his pointlessly monotonous, corporate-cog existence via a Godot-like phone call he’s convinced will come any day now. 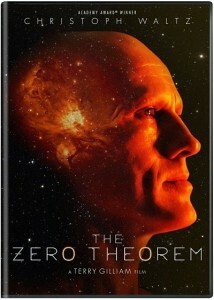 His idiosyncratic approach to his job catches the eye of Management (Matt Damon, Promised Land), who assigns him to the company’s biggest, most top-secret job: solving a mysterious mathematical problem dubbed “The Zero Theorem,” which will, presumably, answer a lot of questions about the nature of the Universe. Christoph Waltz attempts to unlock the meaning of the universe in The Zero Theorem. Gilliam’s narratives are often unfairly criticized for being a mess, and The Zero Theorem will certainly feel that way those of that belief. Waltz is brilliant in his hapless vulnerability, yet audiences will find him cold and unsympathetic, making it difficult to stay emotionally engaged among Gilliam’s bombardment of manic visuals. But it’s actually neither the visuals nor Waltz’ performance that falter—it’s the script. Rushin throws in every sci-fi and philosophical idea he can possibly find into one big stew, leaving it all for Gilliam to sort out. But none of the ideas are really all that original; you’ve seen them all before, more than once, and quite often in Terry’s other movies. The good news is that Terry makes the most out of the script, offering us a deliciously nihilistic world to get lost in, one which has more in common with the bittersweet melancholy of 12 Monkeys than any of his other films. Like that one, salvation comes in the form of a woman: Bainsley (Mélanie Thierry, Unforgivable) is a call girl originally hired to toy with Qohen, only to eventually find herself in love with this miserable recluse. Alas, by the time she declares her love, it’s too late–Qohen’s been messed with one too many times, and paranoia trumps hope as he rejects both her and his last chance at happiness, forever. Yes, for all it satirical elements, The Zero Theorem is ultimately a sad, dark, affair. One gets the feeling that the perennially-giggling Gilliam has finally given up on fighting the good fight against the machine of modernity. And if that’s true, it is a sad day indeed, for he was cinema’s most dazzling crusader. But Gilliam’s ability to express this struggle of the human spirit on screen is what saves the film from its messy script, making The Zero Theorem a visual and emotional personal statement that can’t be denied. Like many of Terry’s films, The Zero Theorem gets better with repeated viewings, and the DVD provides a few extras to bring you deeper into its world, including behind-the scenes and visual effects featurettes. Conspicuously missing from this package is an always-fascinating and fiery Gilliam commentary, and for Gilliam fans, that’s the real crime!